Italy dumped out reigning champions Spain with a masterclass performance in Saint-Denis, gaining revenge as Chiellini and Pelle found the target on opposite sides of half-time. 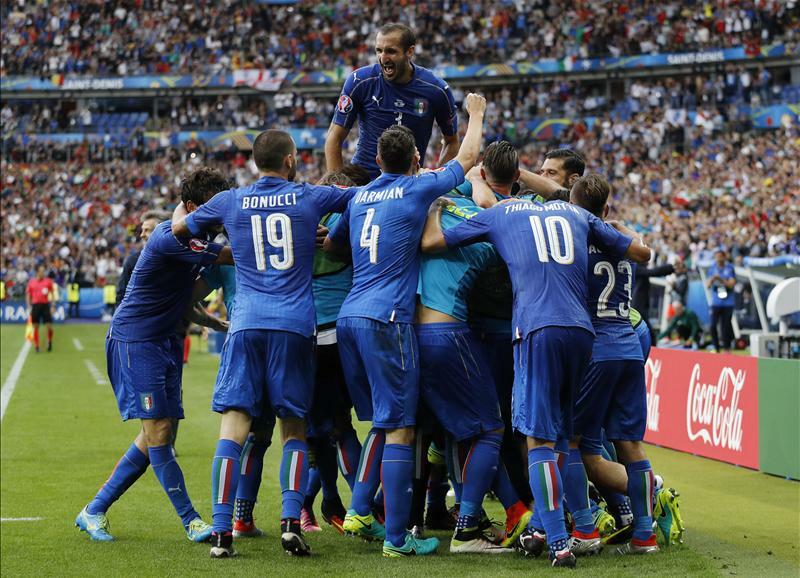 As rain bucketed down at the Stade de France, Italy quickly went on the front foot as they bombarded de Gea's goal. Ramos and fellow defenders had their work cut out early, clearing crosses and snuffing out the danger before anything could materialise. The Spanish keeper was then brought into inaugural action to thwart Éder with a simple stop. But things would only get more difficult for the Manchester United shot stopper who stretched low to palm away a header as Pelle got on the end of a dangerous set-piece. Around a minute later, he'd make another save on Giaccherini's attempt, although the Italian was penalised for a high foot in the box. Spain's attacks came few and far between as the reigning champions tried to string some passes together, although unable to really breach the Italian wall. De Sciglio was blocked while a corner amounted to nothing for the white clad side. Morata would soon be reluctant to attack with much intent, receiving a brute elbow from Marco Parolo during play. Most of the first half followed a similar pattern, as the Italians pushed onwards. Ramos had to clear away from a corner riskily, as the Azzurri showed their strength with set pieces. It was, therefore, only fitting that they would find the breakthrough in such a method. Eder had a free-kick from dangerous range which he struck low towards the bottom corner, with de Gea palming it away but unable to clutch on to it, prompting chaos around the 8-yard box. Giaccherini was felled by the keeper, but it wouldn't matter as the ball trickled into the path of Chiellini who smashed home and gave his side a well deserved lead. They would finish the first-half how they played most of it; on top and in control as de Gea was forced yet again to spring into action to deny Giaccherini. He managed to cut in with a surging run, curling towards the post before it was tipped away. Antonio Conte was indeed a satisfied man as his side went into the break with total dominance. It appeared there would be no let up in the second half as they came racing out of the blocks; Florenzi's cross being stopped after he darted up the field. But there was optimism for Spain to feed on; as a header from Morata was planted straight into the hands of Buffon. All of a sudden, it was all going Spain's way. They were compounding the final third and piling enormous pressure on their opponents. Silva squandered a big opportunity far out before Morata's continuous patrolling caused numerous issues. More heroics from de Gea to stop Eder who was through allowed them to continue in such a manner. Vassquez then hit the post before a volley was denied by Buffon, as Italy refused to let up. A double save by the keeper kept them hanging in it and it was all set up for a nervy finish in Saint-Denis. A free-kick was played in long and over towards Pique, who stretched to prod it towards goal but it was tipped away by Buffon as he dived to the ground, with everyone on their feet in admiration. Then, came the final sucker punch as Italy booked their spot in the quarter-finals. With Spain lacking balance on the wings as they piled forward, Insigne switched wings with a lovely cross-field pass, where Darmian was waiting to break into the box and cross it to Pelle, where it bounced up for him to smash into goal. Conte leaped up in joyous celebrations as did the whole of Italy, as they exacted revenge on the side who denied them of European glory 4 years ago.